Investigators say an Allentown man was miserable and took his anger out on his loved ones in a calculated car explosion that left his two-year-old son and another man dead. Now, police are piecing together that car explosion. A man blew up himself, his 2-year-old son and a friend in car explosion in Allentown, Pennsylvania, which authorities say was a murder-suicide. Jacob Schmoyer exploded a homemade explosive device in his car, officials with the federal Bureau of Alcohol, Tobacco, Firearms and Explosives said at a news conference Thursday with prosecutors and police. "We are very confident at this point that it was Mr. Schmoyer," ATF Philadelphia Field Division Special Agent in Charge Don Robinson said. And, they said, Schmoyer specifically targeted his friend, David Hallman, as well as his own son. Jonathan "JJ" Schmoyer was secured in a car seat in the back of the car. The explosion on West Turner Street scattered debris and body parts over several city blocks in the Lehigh Valley city. 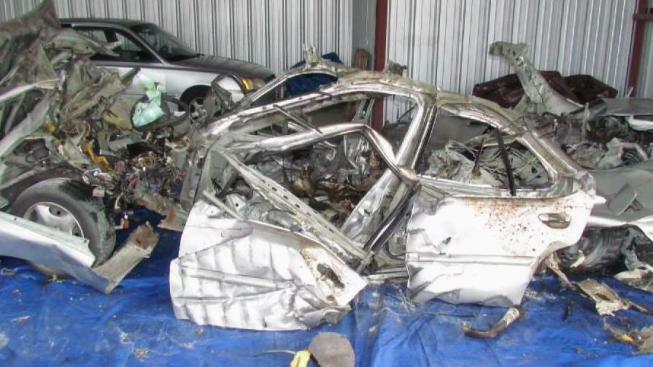 Authorities released this photo of the exploded car after their investigation. Schmoyer had sent four letters to family and Allentown police that were received after the incident. He said he was miserable, accepted blame for the murders and even detailed how he constructed the device. "There was a lot of hatred there," Robinson said. "Some directed at Mr. Hallman and some at his son." Schmoyer also confessed to a series of other criminal acts, including burglary, in the letters, which authorities were having authenticated. Schmoyer likely placed the device near the center console and got the other two people into the car, Robinson said. "I do want answers. We all want answers," Schmoyer's grandmother, Kathleen Pond told NBC10 earlier this week. "That's probably the most important thing." Police reopened Turner Street after spending days recovering evidence that helped them reconstruct the car. They believe some evidence could still be on the scene, and have asked anyone who spots debris to not touch and contact Allentown police. SUICIDE PREVENTION HELP: Here is information on suicide prevention from the National Institute of Mental Health. If you are in crisis, call the National Suicide Prevention Lifeline at 800-273-8255 or reach out to the Crisis Text Line by texting 'Home' to 741741. Correction: This story has been corrected to identify the 66-year-old victim's name as David Hallman.